In the Daily Planet, Perry lights into Jimmy, berating him for not getting the scoop on Lena and the deaths. Perry asks Jimmy why. Jimmy says, "Because it's really none of your damned business, Perry"
Perry sends Jimmy out of his office. Lois tells Clark what happened, and that Jimmy needs a friend. Jimmy sits in a park alone. Superman flies down and tries to explain why he told Lena what he did... it saved lives, it stopped chaos. Jimmy explains that Lena wasn't just tech. She was a person. She won't talk to him anymore. An artist in the park sends his dinosaur tech creation to walking, and Superman encourages him to keep his art on a smaller scale. When he turns around, Jimmy is gone. In prison, Professor Killgrave/Sledge rests. Rebecca Muldoon arrives for an interview with the hybrid. Killgrave is the only one who wants to speak.Sledge just wants to sit with his back turned to the wall. Killgrave invites Muldoon closer. Muldoon tells Killgrave that she may have a way to make him more comfortable. 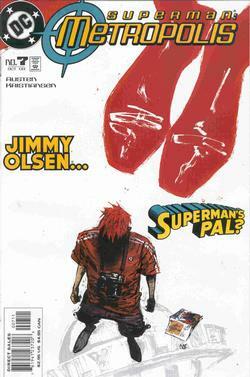 Killgrave asks if she knows Jimmy Olsen. She says she does. Jimmy walks alone, feeling miserable about Lena's absense. Superman arrives again, and takes Jimmy up to the top of a tall building. They talk of love, and Jimmy asks Superman about his wife, and if it was the same with him. Superman says yes. Jimmy asks if he and his wife Wonder Woman ever fight in the JLA Watchtower. Superman tells Jimmy he's not married to Wonder Woman, and Jimmy is surprised. He says if he could have any woman in the world, he'd have Wonder Woman. Or Salma Hayek. Superman tries to change the subject, but Jimmy won't let him. Back with Muldoon, Killgrave comes closer. Now Sledge is interested in her proposal. She tells him to secure bail and then they will talk, but Killgrave indicates he wants to break out. He proceeds. Superman and Jimmy have a lively conversation about his mortal wife's reaction to Wonder Woman. Jimmy wonders aloud if Superman thinks himself superior to humans. Superman is astonished, and tells Jimmy otherwise. Jimmy wishes he could have Wonder Woman again. Superman tells him that he wouldn't survive the experience. She's an Amazon. Superman tells Jimmy he considers himself to be a human. He watches TV, likes sports, has a wife. His wife threw away his favorite suit the other day because it had a few laser holes in it. Come on! He tells Jimmy he respects that he wants to be powerful. He tells Jimmy about a time that a crazy woman jumped off a bridge wearing nothing just for his attention. Superman checks radio bands and tells Jimmy he's glad to be able to have the conversation. Jimmy tells him that things were a lot worse when it was just the supreme Superman dictating what would happen with Lena, and now that Jimmy sees how human Superman is, things are a lot better. Superman tells Jimmy that Lena is moving slower... she misses him too. He apologizes that he had to put the city before his friend. Jimmy accepts. Superman realizes the tech has to go. Story - 5: This comic is where Superman needs to be. We have characters, the main characters, and there is still possible creativity. We have Killgrave, Sledge, Muldoon, well-fleshed out and interesting, but we're not sacrificing Jimmy, Lois, Perry, Superman, even Bibbo. Continuity is preserved. Superman's wife is still known to Jimmy, and ramifications of the photo Jimmy took are FINALLY explored, as they should have been long ere now. And most important... not a single blow fell in this issue, but it was great cover to cover. Superman and Jimmy become, as they have never been, PALS, in the sense beyond action. A masterful new direction for two long loved characters. Austen is very well grabbing my seal of approval. If he takes the helm, Superman might just return to the greatness the last few years have not spoken to, with Loeb and Mac's help. I mean, did you see the last issue of Adventures? A Lex soliloquy about being born into power. What do the writers do for research, watch Smallville? I mean, I love Smallville, but it's alternative continuity. Lex killed his parents for money and grew up poor and hated. That's why he's who he is. Smallville is a different Lex. A great Lex, but not the Lex of today's comics. It's why I resent things like the Birthright remake of a good, necessary history. My point in this ramble? I have no doubt that when Lex meets Superman in Metropolis (and my bets are on it happening), I believe, for the first time in a great while, that it will be done right. Well done on this one, Eddie. And well done, Austen. The more this series takes shape, the better I like it. One issue didn't sit with me, the rest have been golden, and I haven't been able to say that with a straight face since the Loeb run a while back. I am loathe to say it, but with this artist, sometimes Superman looks like the maitre-d from Cabaret, or, better, Dietre from Saturday Night Live. Would you like to see my monkey, Herr Olsen? Especially as Clark Kent. But it's forgivable. The rest of the book is gold. Cover Art - 4: Almost perfect. The background is what nails it down to 4. But folks, folks, folks... it HAPPENS IN THE STORY, it's artistic, it's captivating, there's a reference on the ground, an old issue of Superman's Pal... it makes SENSE! It's great stuff! And for the most part... check this out. The logo is ON THE PAGE! The target's a little off, but the words... good god! Spiderman feet, but eh. Feet never turn out right. Captivating. Amazing lighting. A good cover. Representative. Fair. Worth every penny.